The bees were calmer throughout our relocation project than we expected although their patience was finally exhausted towards the end. 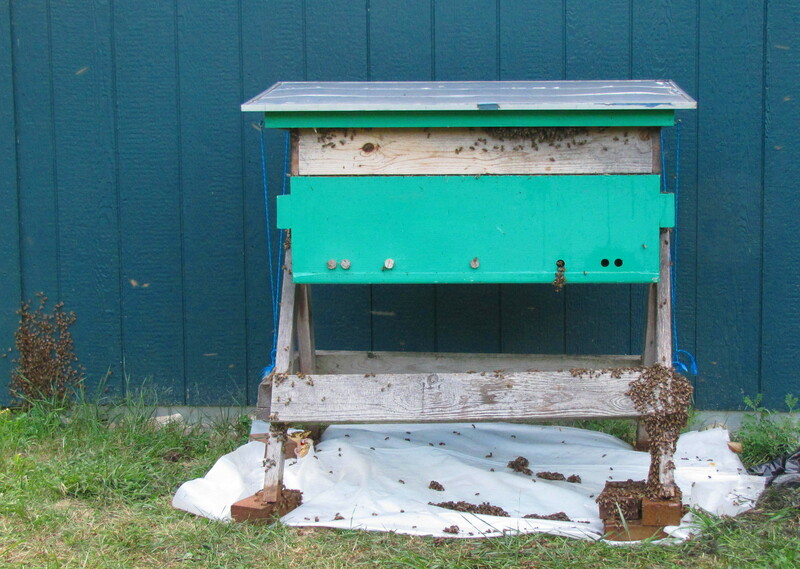 There were bees in the air, on the hive’s face, under the hive, on the hive stand, on nuc parts, just everywhere. Our gloves were decorated with feckless stingers and we collected a few injuries as they found weak spots in our armor. But there was little choice except to persist until nuc Angharad’s bees were housed in hive Clarissa. Then we had to take a long detour to discourage a group of unusually persistent followers and beelessly re-enter our house. Nor were they quite settled by next day when we took the picture above. Not all the bees had found their way inside the hive. 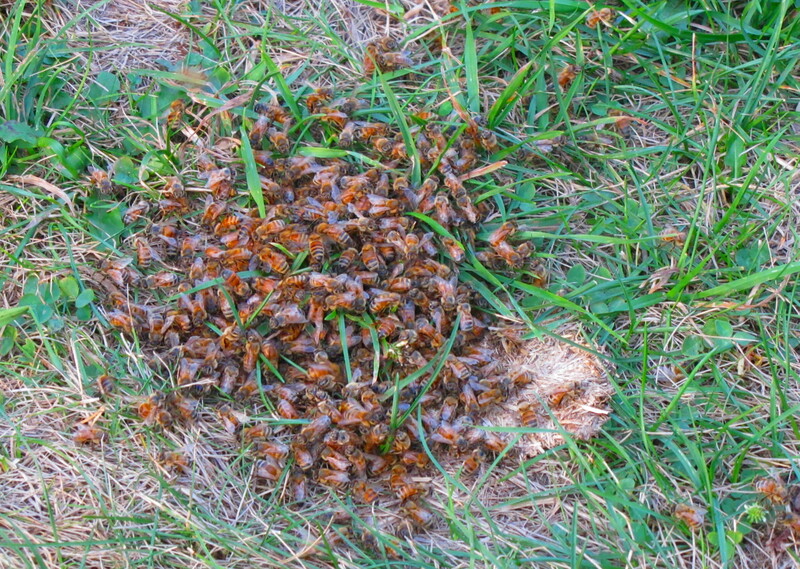 All the patches of bees from the day before were still in evidence, including the one on the ground where the nuc bodies had briefly sat. Of greater concern, the entire backyard felt under siege by a cloud of confused bees. We could not approach the barn without collecting a few interested followers. One particularly upset bee would come to buzz us as soon as we left the back door of the house. We did not acquire any more stings but it was unnerving to get such attention when not suited. Nor did we look forward to suiting up each time we needed a bit of basil from the herb bed or the lawn needed mowing. We feared for visitors. As the day progressed the cloud pulled back to Clarissa ceding our backyard to us, leaving just the one angriest bee stubbornly menacing us each time we left the back door. Internet lore is that such especially defensive individuals occur even with the gentlest bees and one should simply swat them dead and be done. We considered suiting up and standing outside as a target to be stung by her, after which she would naturally die. But by evening even she had relented (or died of apoplexy) and things were back to a tolerable approximation of normalcy. The patches of bees had vanished except for the one on the barn. Suiting up we carefully studied the little cluster, looking for a queen but not finding one. It seemed one explanation for these bees thoroughly ignoring the hive a few feet away, right where their old home was. But then if the queen were there surely the cluster would have grown rather than diminished. Another week later we tried gently collecting the bees by brushing them onto a tray and then dumping them on the hive roof to find their own way in. Where they had been was dotted with tiny bits of white wax, which we tried to remove without scraping the paint. 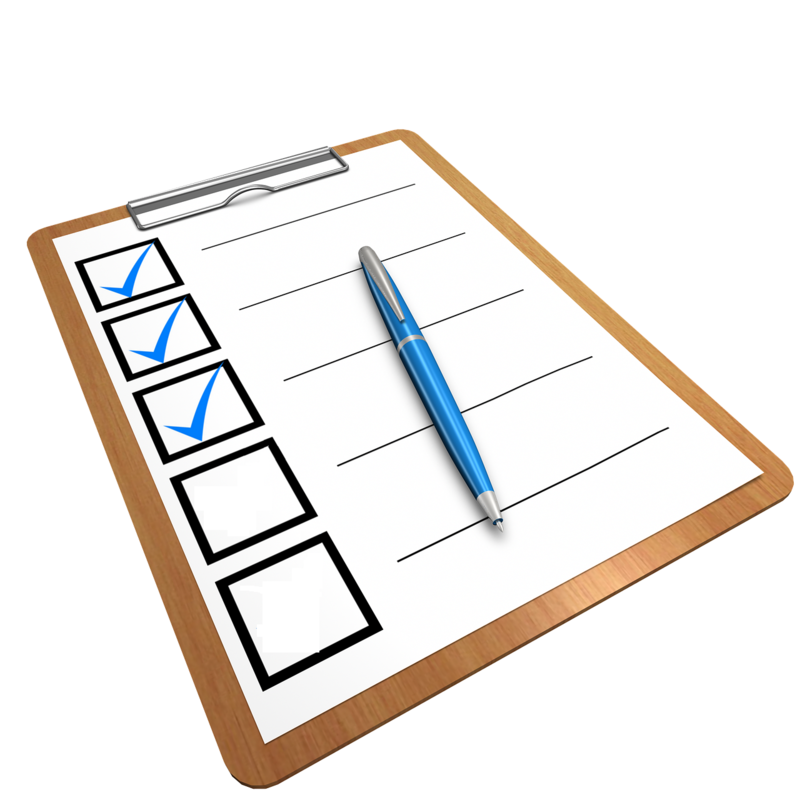 The little cluster keeps reforming in spite of frequently being brushed or washed off and is there even now as this is being written. What pheromones are they leaving? Perhaps we shall have another location on which swarms will gather. And what of the former Clarissans, the bees that had been dumped by the fruit trees? Both Beatrix and Frankie seemed to have sudden population increases, judging by their beards in the hot afternoons. Yet Dorcas, who was a nearest neighbor of Clarissa, somehow managed not to acquire any refugees. She is looking worryingly small by comparison. Actually she is just looking worryingly small. Sigh. The post about our weeks-spanning adventure grew far too long and so has been broken into three pieces. It shall not drag on like the series whose titles we are punning. Here then is the first part. On Sunday two weeks ago (2018-Jul-29) weather and schedule permitted us to open each of the hives for inspection and a few sugar rolls. We found that Clarissa had no mites at all. But also no queen and no worker brood. All the brood frames looked rather like the picture at left, proud with copious drone brood. We concluded that we had too long left Clarissa to her own devices, missed some misfortune befalling the queen, and now have the curse of laying workers. Worker bees are a caste of female bees with nonfunctional reproductive systems, the ovaries being suppressed largely by pheromones from open worker brood. As with many statements in beekeeping this is only mostly true. A healthy queenright colony may have a small percentage of workers with ovaries sufficiently mature to let them lay eggs. Of course, they have never mated and so will lay only drones. Their eggs are usually eaten by the other bees but if one finds a tiny patch of drone brood far off in the honeycomb then it may be a laying worker’s sons. At any rate a small number of laying workers is normal and not a problem. 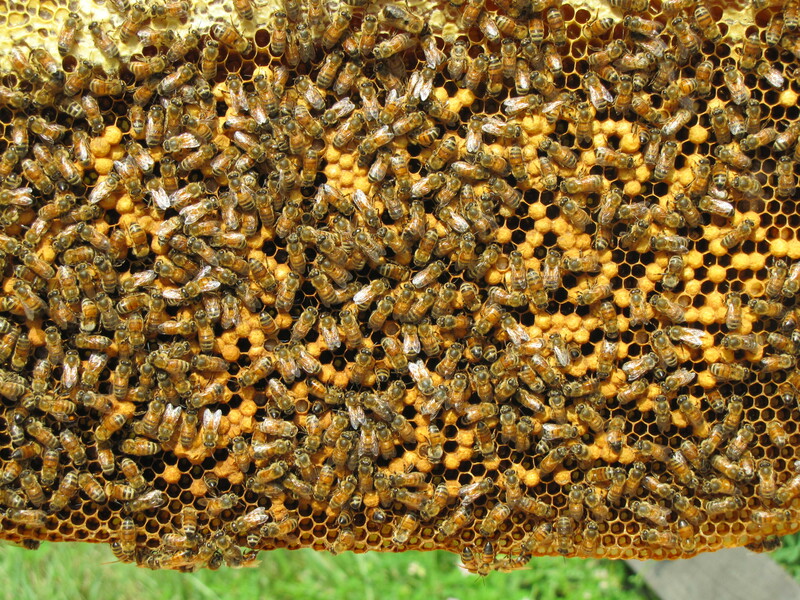 But if a colony stays queenless long enough it will become broodless as well and eventually a very large number of workers will develop their ovaries and start laying drone eggs, even if their sisters foolishly build queen cells for them, as in the picture at right. Drone brood does not have the suppressive quality of worker brood so the number of laying workers will increase. Such a colony is doomed as the females, who do all the work, eventually die without replacements. The drones simply move on to other colonies and may have a chance to at least propagate some of the dead colony’s genes. There are any number of procedures in the lore to try rescuing the colony by requeening or combining with a queenright colony but they are prone to failure by regicide. Weekly donations of open worker brood from another colony are said by some to eventually restore normality and allow the colony to make its own queen. But it is not guaranteed to do anything except weaken the donor colony. 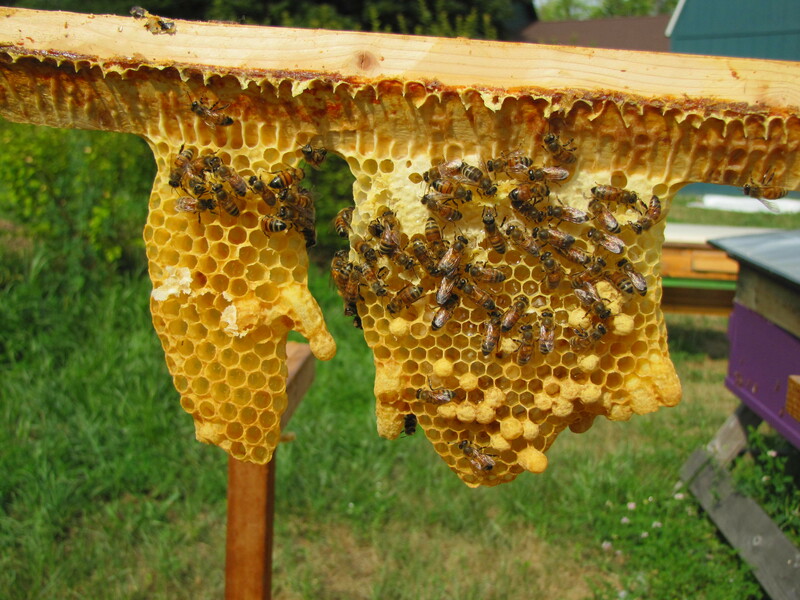 The surest solution is to simply dismantle the hive and dump the bees near the apiary, not too close to any one hive, and let the homeless bees try finding their own way to acceptance in some other, queenright hive. Some claim that it is nurse bees that become laying workers and so will not fly to a new home but perish. Others are less dogmatic about this but trust that guard bees will not allow a laying worker to enter, since she will not smell right. However it works, this was the approach we chose. Second part soon to come.